What happens when a father chooses a rock star over his own son? Though few will ever have to compete with the likes of Johnny Cash for their papa's attention, My Father and the Man in Black serves as a cathartic parable for parents who, while ably providing for their children, are paralysed at the thought of having to converse with and emotionally engage them. The twenty years that Jonathan Holiff knew his father, he barely saw him. On those rare instances he ordained to return home, Saul Holiff mostly communicated with his son via notes slipped under his door, written in the style of contracts agreed between himself and the musical acts he represented. As manager for country legend Johnny Cash, ensuring that the self-destructive outlaw was able to walk the line from gig to gig was a full time job that left no room for family. The film's opening scene is a recording of one of the intermittent phones calls from the road that perhaps best encapsulates Jonathan's fatherless childhood. An empty promise of the two of them spending quality time together and playing baseball on vacation would remain eerily unfufilled after Saul committed suicide in 2005. Leaving no note and previously demanding that upon his passing there be no funeral or family gathering, Saul proved as neglectful of his son in death as he did in life. We see many of these crushing disappointments – including the suicide – as imaginative reconstructions. As Saul pops pills, downs his last vodka and orange and ties a garbage bag over his head, footage of one of Cash's frequently cancelled concerts (often due to an incapacitating mix of amphetamines, barbiturates and alcohol) is superimposed around the perimeter of the living room. The swelling roar of disapproval from the crowd bluntly expresses the filmmaker's inchoate rage at his father's unaccounted for absence. It's a powerfully on point visual juxtaposition. Just like his star act, Saul's perpetual no-show is marked by a retreat into booze and drugs on which he had become depndent later in life. In this fashion, the visual structure of the film artfully embodies its concerns, the matte lines seperating stock footage from the modern day reconstructions, plainly commenting on Holiff's inability to reconcile past with present. If like Holiff, you're not a fan of talking head documentries, you'll very much appreciate the film's onus on the visual and in any other year where it wasn't coming hot on the heels of The Imposter, Holiff's technique would have felt all the more striking. So soon after Bart Layton's film, simply setting the voiceover to matching stylised imagry lacks the brio of having it switch between omnipotent narration and active participation as it did in that film, not only interrupting, but also becoming becoming part of the dialogue spoken to camera and between characters. As our following conversation attests, it would seem that for Jonathan, making the film was a remedial measure that worked wonders for his self-esteem in a way that previously becoming a talent agent like his father had not. He may never be granted the respect and acknowledgement he so coveted when Saul was alive, but examining their deeply dysfunctional relationship in the investigative format of documentary has afforded him precious peace of mind. 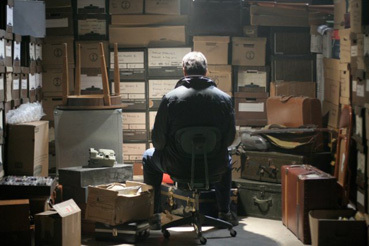 With necessary artistic distance, Jonathan has been able to make sense of the most galling memories, rifling through them in the editing process much like he did his Saul's belongings, when years after his passing he discovered a storage room full of clues about who his father really was. Amongst the aertfacts, a daily audio diary going back many years, personal correspondences with Cash, itemised expenditures down to the last cent and a treasure trove of one-of-a-kind memorbilla from life on the road with the singer. Having unearthed this material, events that might otherwise have crippled his life forever have been somehow gilded with the harshness rubbed off. The ugly truth now accepted with incadescent understanding. You only need to listen to the voiceover to appreciate just how much Holiff has come to terms, reiterating events calmly and matter-of-fact, though it must be said, his monotone PBS quality fails to infuse requisite excitement in the rock n' roll antics he's describing or convey the conflicting emotions of life-altering discoveries. Not there to tell his side, it's down to Jonathan to atone for his father's sins. Rather than malign the man found wanting in parental qualifications and affection, the film stands very much as a monument to the manager who put all his resources, know-how and finances into Johnny Cash's career, buoying his public persona through the scandal of a National Forest fire in Los Padres, California which desiccated several hundred acres and an arrest for drug-smuggling (hardships conspicusiously absent from James Mangold's Walk the Line, much like the character of Saul himself). When promotors grew wary of repeat behaviour that violated agreements and the headliner's penchant for not showing up at the venue, Saul was the man who pursuaded them otherwise. It was Saul who introduced Johnny to June Carter after he put her in his band to broaden his artistic appeal and who then re-defined Johnny's image as the voice of the desperate and dispossessed, instigating the world famous concert at Folsom Prison. Not only was he the designated driver without whom Johnny wouldn't have made it to a single show, more significantly, he was the mentor through whom Johnny saw the world and started to enjoy life, during a career upturn that saw Ring of Fire burning up the charts. The sad irony of Saul Holiff is that he had unerring business sense but not the sense to know when to quit. When he finally did in a fashion unbecoming to the business ("Managers don’t quit superstars, they get fired") it was too little too late. His priorites were all wrong and clearly, he knew it too. After so many years of negligence and emotionally impassive by nature, he was never going to admit his mistakes to the people who mattered most. 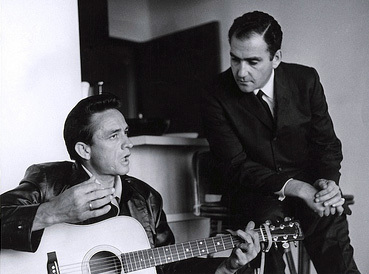 Recorded confessions to the Man in Black about these regrets and the certainty that he could never re-build the relationship with Jonathan to where it ought to be are profoundly moving, even as all we're watching on screen is a slowly spinning reel of tape. In the undulating rise and fall of a great artist, Saul Holiff was the architect of an even greater legacy, paid for in part by the family he left behind. I'm no Cash expert, so I can't speculate on the film's anecdotal interest, but the misbegotten father-son story behind the icon guarantees you'll never hear his music the same way again. The film is currently without UK distribution and I write this enthused review in part to encourage the likes of Soda Pictures or Dogwoof to acquire it. My thanks to Lucy Middleton for arranging the interview and Patrick Chamberlain for filming it.